But apparently, the best growth in seven years isn’t good enough for Wall Street which is feeling a bit ‘biblical’ these days. Right out of the story of Joseph in Genesis, Wall Street is worried that these seven years of ‘plenty’ will be followed by seven years of relative ‘famine’. As it usually does, I believe Wall Street is over-reacting. Yes, a recession is coming… eventually. But I believe it will not arrive until late 2020 or even 2021 and it will be caused, as usual, by a misstep by the Federal Reserve. But it’s just too soon to get out of stocks now. 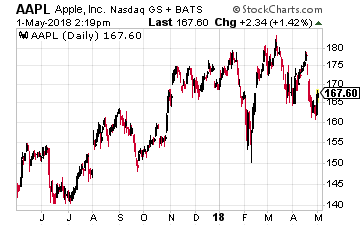 If you do, you will miss a lot of upside that still remains, especially in the large cap technology stocks, such as ‘old tech’ stalwarts Intel (Nasdaq: INTC) and Microsoft (Nasdaq: MSFT) as well as the new tech titan Amazon.com (Nasdaq: AMZN). Its first quarter showed all the doubters that Intel’s long-running efforts to carve out a future in the post-PC era is moving along nicely. Revenues from its newer endeavors in markets including autonomous vehicles and artificial intelligence (AI) were about even with revenues from its PC chips for the first time ever! Thanks to the surprising boost from these markets, Intel reported revenues were about $1 billion ahead of Wall Street estimates. 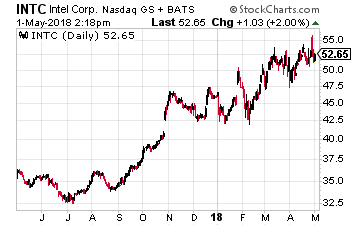 This outperformance was largely due to a 24% jump in revenues from the data center division, which has quickly grown to become the second pillar of Intel’s business behind its PC-related business. Demand from customers in this sector had driven growth, with “a significant bias for high-performance compute” leading to a shift in chip sales towards more powerful chips and therefore higher average selling prices. Further expected expansion in these newer markets for Intel allowed its management to raise its revenue forecast for the rest of the year by 4%. And it confirmed that CEO Brian Krzanich made the right moves when he acquired Altera (its products are used in AI) for $16.7 billion and Mobileye (driverless vehicle technology) for $15.3 billion. I expect Intel to continue “to step on the gas” with even further investments into faster growing markets away from PCs. Its stock, already at a 17-year high, will also continue to accelerate. Another company that has broken away from its PC past with a bang is Microsoft. The company looks to be on track to record its best annual growth for more than a decade. This follows a revenue boost from its cloud business in the latest quarter and a bullish forecast for the final quarter of its fiscal year. Microsoft reported revenues of $26.8 billion, boosted by growth of 17% in both its intelligent cloud division and its productivity and business processes group. 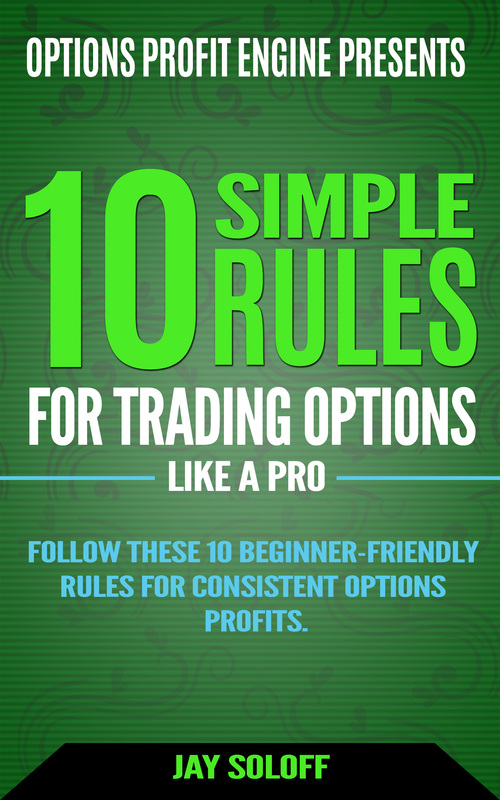 That was $1 billion ahead of Wall Street’s expectations. Earnings per share rose by 36% to 95 cents, compared with expectations of 85 cents. 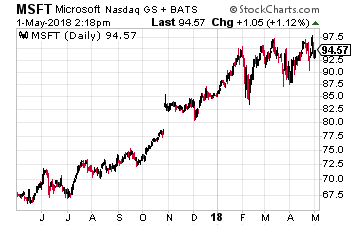 Microsoft’s management forecast revenues of as much as $29.5 billion in its current quarter, which is roughly $1.5 billion above most analysts’ estimates. Hitting that target, which is likely, would represent growth of more than 20% for the year to June. Underpinning Microsoft’s move into becoming a growth company is its move into the cloud. In the latest quarter, the company showed a 58% jump in revenues from its commercial cloud operations — its Office 365 productivity service, Azure cloud platform and Dynamics 365 cloud applications. They a accounted for 22% of overall sales in the quarter at $6 billion. Azure continued its explosive growth, with revenues growing by 93% from a year earlier. This firmly cements Microsoft’s place as the second-largest public cloud computing platform after Amazon Web Services (AWS). “We’re still in the early innings of the cloud transition.” Nadella also predicted that further growth in the cloud would lead to a jump in “lower-margin services first [and] higher margin services over time”. Under Nadella’s leadership, Microsoft is once again a growth company. I don’t see that changing any time soon. 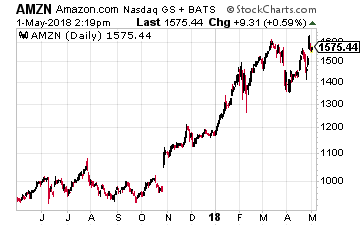 That brings me to the aforementioned Amazon, which completely blew away all of Wall Street estimates by posting earnings that were more than twice as good as had been expected – $3.36 a share versus $1.27. Revenues for the first quarter jumped 43% to $51 billion. Amazon’s net income more than doubled to $1.6 billion, due largely to what it called “very strong customer demand” in its cloud computing services business and a darn good performance in its online advertising business. Its AWS business grew by 49% to $5.4 billion and now makes up about 11% of its total sales and almost 75% of its operating income, at $1.4 billion. And talk about positive forward guidance… in its outlook, Amazon said operating income might triple in the current quarter. It gave a guidance range of $1.1 billion to $1.9 billion, up from $628 million in the second quarter of last year, with net sales growing as much as 42% to between $51 billion and $54 billion. That sort of growth is almost unheard of in a company the size of Amazon. Add in the $3.1 billion that Amazon Prime (with 100 million subscribers) and services like Amazon Music Unlimited brought in and you have an almost unstoppable juggernaut. This growth is the main reason why Amazon is the top challenger to Apple (Nasdaq: AAPL) in the race to a $1 trillion valuation. A race where one company is still sprinting and another company seems to have dropped the innovation ‘baton’. The bottom line for you is that even if you are worried about growth or inflation, stick with the companies like these three that have idiosyncratic growth. And that can raise prices like Amazon, which is raising the price for its Prime membership by $20, from $99 to $119 a year, adding billions of dollars to its revenues to the bottom line. 3 Stocks That Could Go to 2,524%! 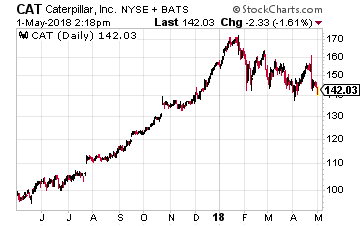 Don't risk your money on IPOs, risky tech startups… or the next Pets.com, Snapchat, Groupon, Webvan hyped by the financial media as the next big thing… all of them black holes for investors’ hard earned money. Instead, bank on these 3 high-growth tech stocks that offer a high likelihood of outperformance in the near-term, and a chance of TRIPLING – even quadrupling – before the end of the year! Click here for names and details.